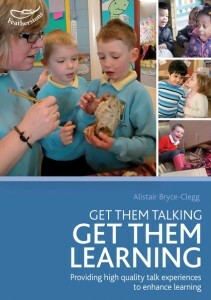 Providing high quality talk experiences to enhance learning. Young children are fascinated by the world around them. They have high levels of natural curiosity and a compelling desire to explore and experience EVERYTHING! As children develop the skills of language and communication it is talk that helps children to make sense of those experiences by asking questions and talking about their thoughts. Talk not only plays a pivotal role in helping children to understand the world around them, it also enables them to learn how to make sense of the role that they play within in it. After all, talk is just the thoughts that you have in your head coming out of your mouth. If you haven’t got many thoughts in your head then you won’t have much to talk about. Alternatively, if you don’t have very much experience of language and talk, you will not be able to express your thoughts. Our role as practitioners is to create a wealth of learning opportunities and experiences that will fill children’s heads with thoughts and questions and then support them in acquiring the language to be able to communicate those thoughts to make sense of their world and be understood.